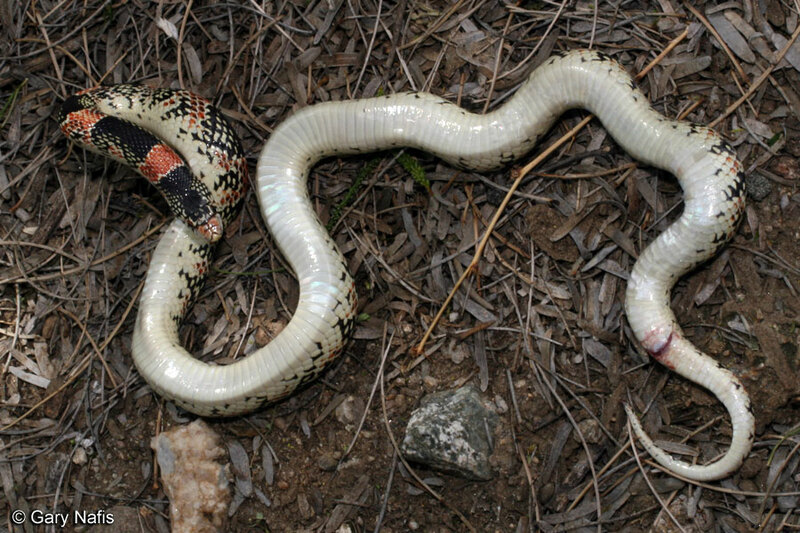 A Long-nosed snake crawls across a road in San Diego County. 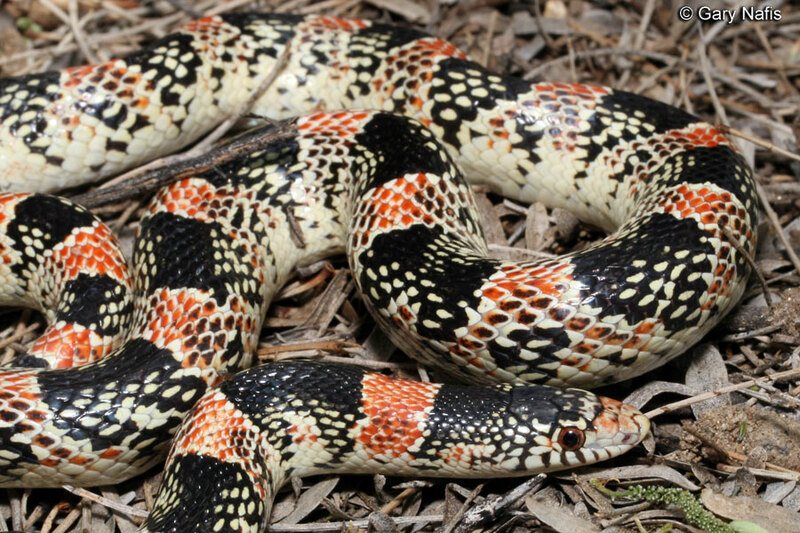 This video shows a Long-nosed Snake using a disgusting but effective defensive behavior - it coils up with jerky movements then smears itself with red fluid from its cloaca. After that I certainly did not want to touch the snake again. 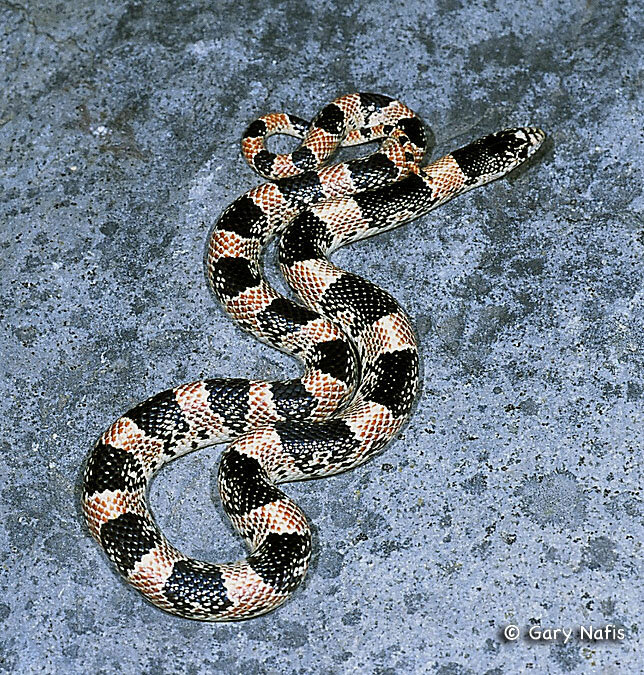 A black and white Long-nosed snake crawls at night in the Arizona desert. 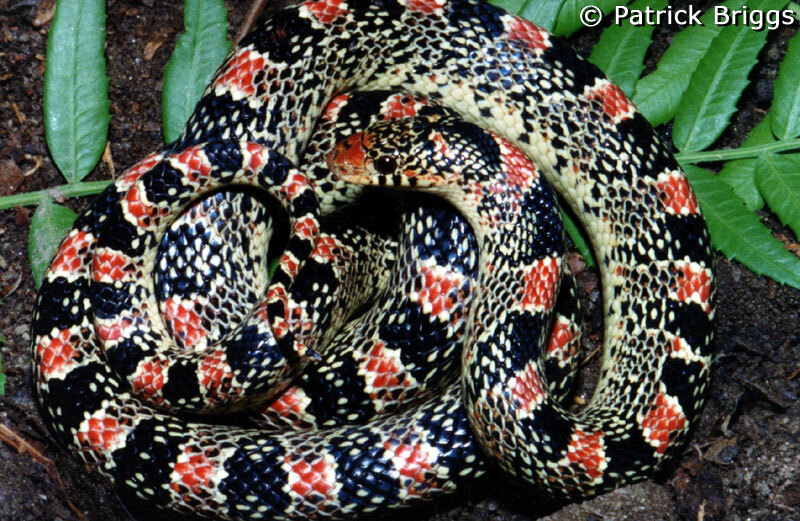 Watching this short video you can get an idea of how this fairly fast snake moves. 16 - 60 inches long (40 - 152 cm). 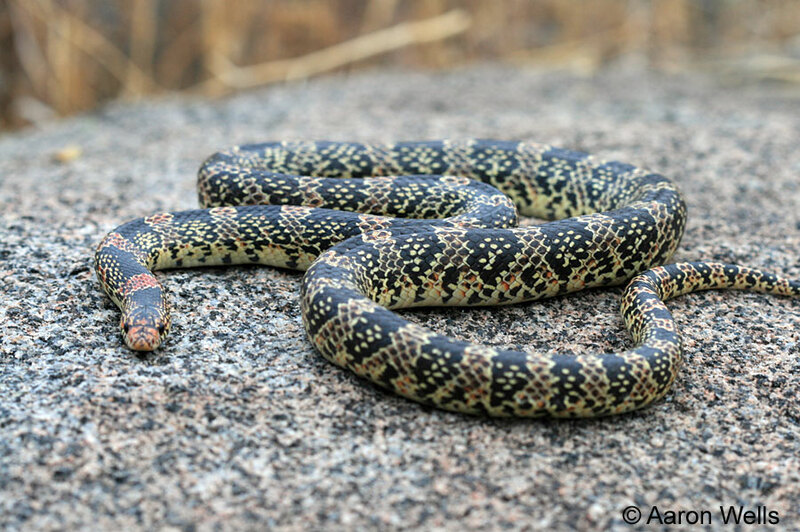 Most snakes seen are 16- 30 inches long (40 - 76 cm). Hatchlings from 7 - 11 inches (18 - 28 cm). 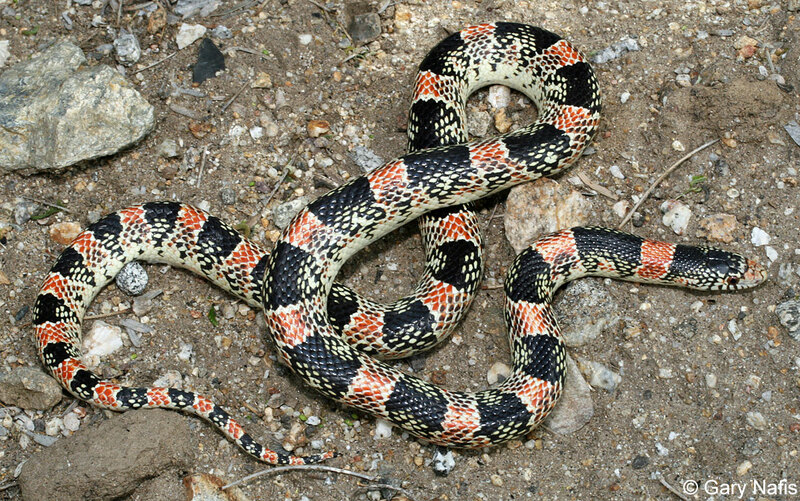 A slender snake with smooth scales and a head barely wider than the body which has a long pointed snout with a countersunk lower jaw. 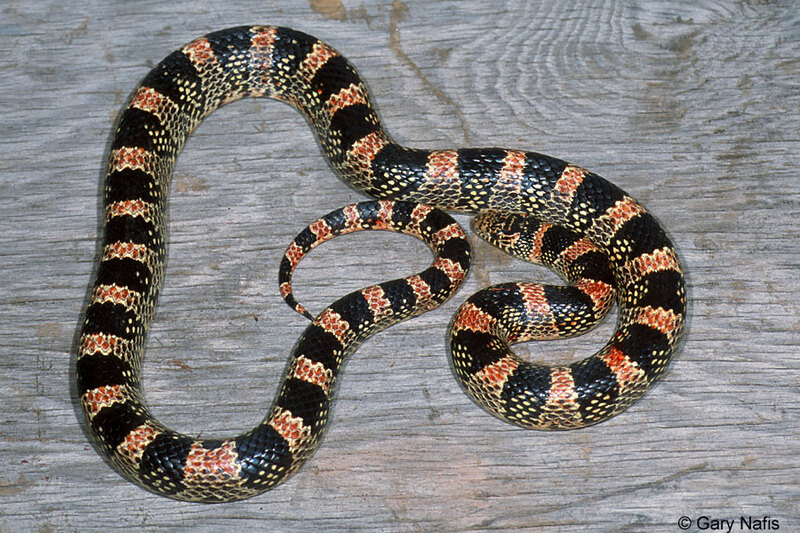 Most snakes are red, black, and white, with a saddled pattern. 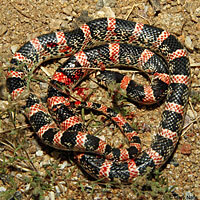 The ground color is white which is usually heavily speckled with black and red from the alternating red and black saddles. The saddles do not ring the body. The underside is cream or yellow with no pattern. 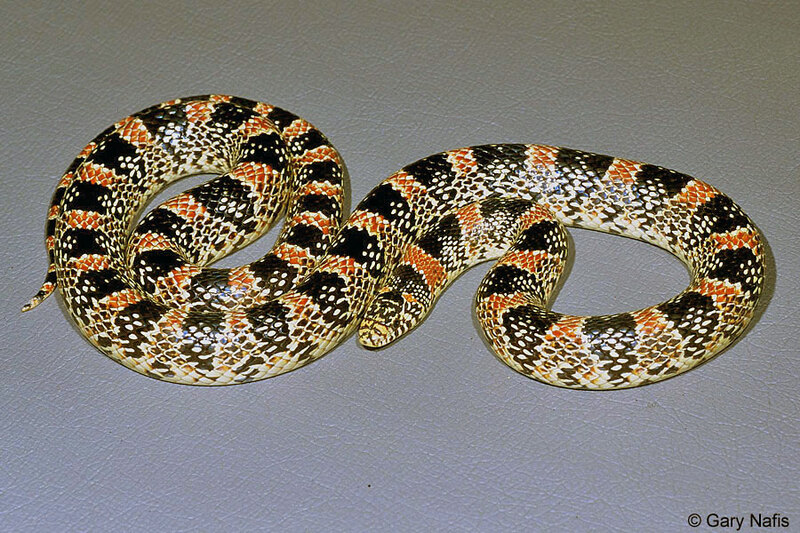 Some snakes have no red. These are considered the "clarus" phase, and at one time were regarded as a distinct subspecies, Rhinocheilus lecontei clarus. Occasionallly found out at mid day. Relatively cold-tolerant, especially in the northernmost part of its range. 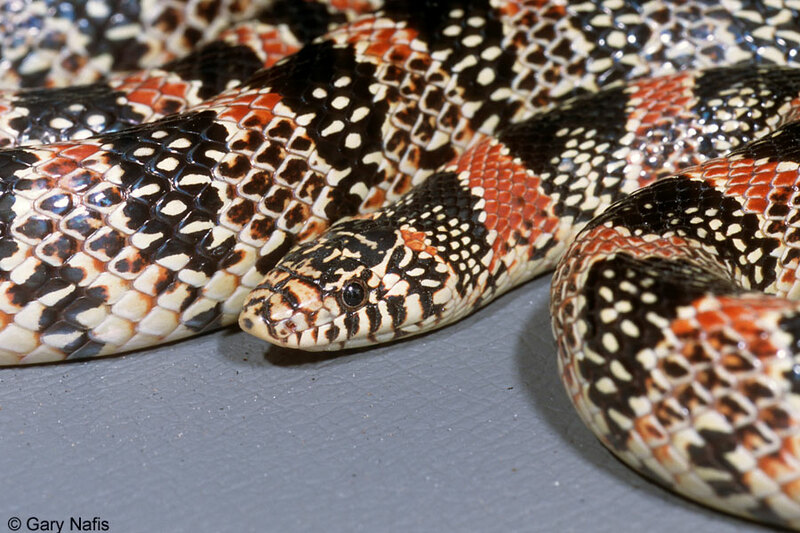 Good burrowers, spending much time underground, often in lizard and mammal burrows. Commonly found on roads at night. 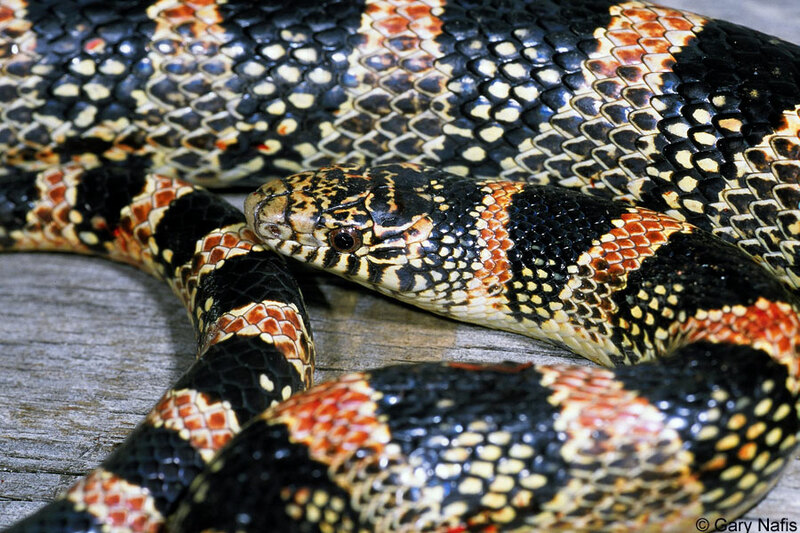 When threatened, may vibrate the tail, writhe the body, and evert the vent, excreting blood and cloacal contents. Eats primarily lizards (especially whiptails), also lizard eggs, small snakes, small mammals, nestling birds, possibly bird eggs, and insects. Small prey is overpowered, large prey is killed by constriction. Lays eggs June to August. 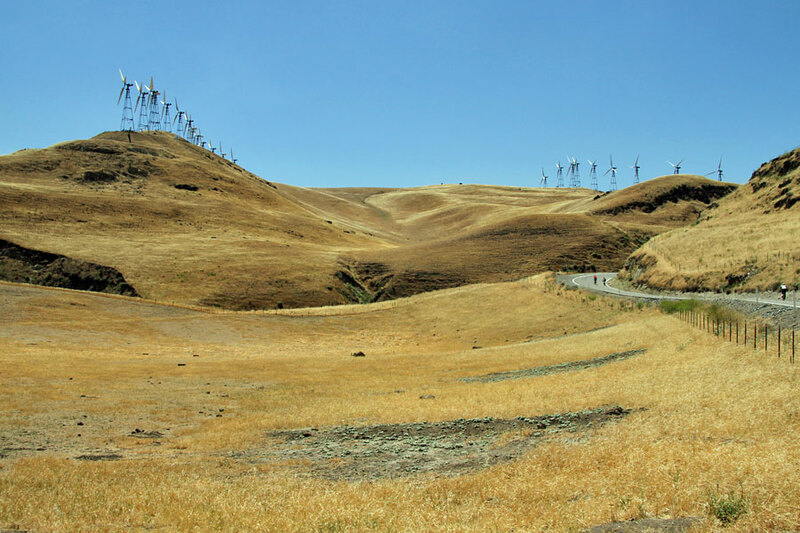 In California, occurs throughout the south coast and deserts, north through the central valley and Coast range, excluding the coast, north to the Sutter Buttes, Sutter County. Not recorded from the coast north of Santa Barbara County, but possibly present there. Also ranges north in the deserts east of the Sierra Nevada Mountains as far as the Honey Lake Basin in Lassen County. Outside of California found in northern Baja California, Nevada, Utah, Arizona, barely into New Mexico, and south into Mexico. An isolated population also occurs in Idaho. Sea level to 6,200 ft. (1,900 m). Arid and semi-arid deserts, grasslands, shrublands, and prairies. 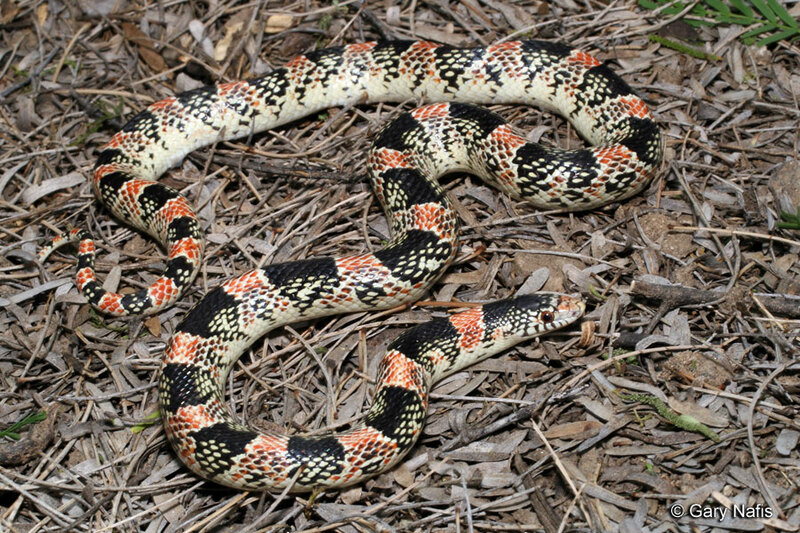 Related to and sometimes similar in appearance to the California Kingsnake. 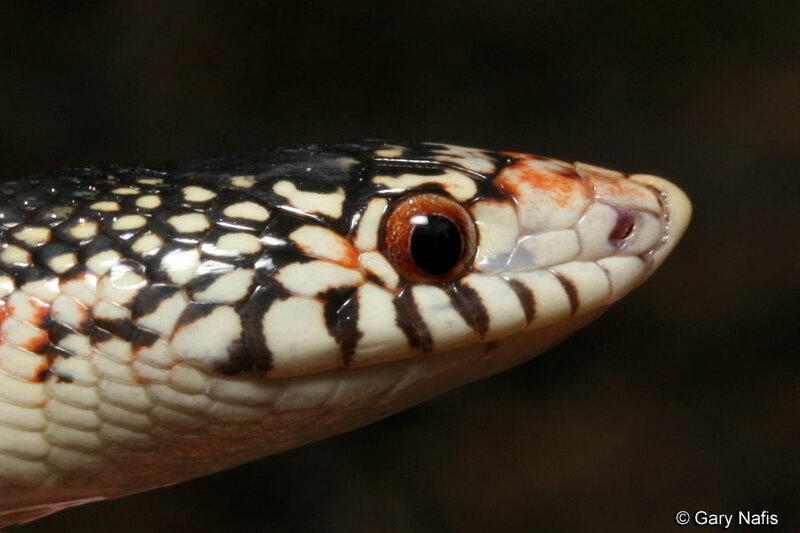 Long-nosed snakes have most of the caudal scales in a single row, while Kingsnakes have caudal scales in a double row. 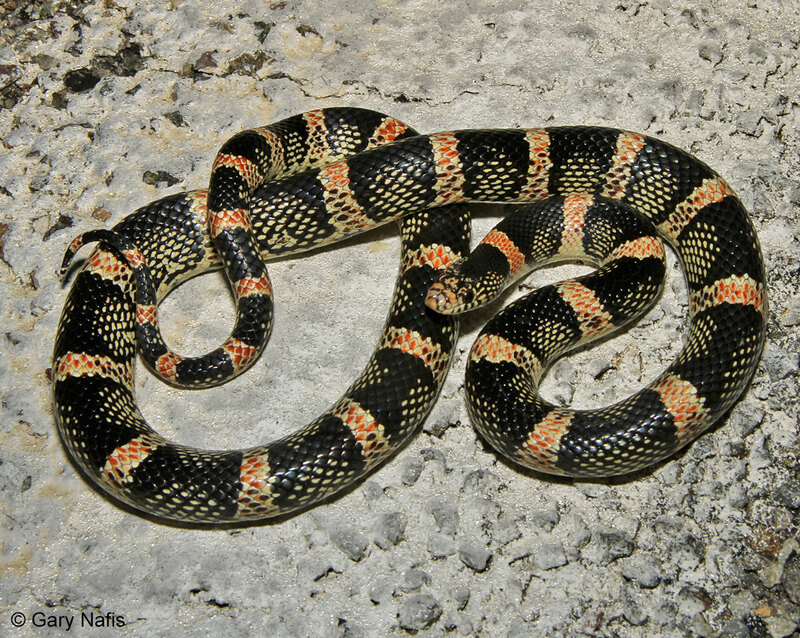 Two subspecies of R. lecontei were once recognized, R. l. lecontei, and R. l. tesselatus - Texas Long-nosed Snake. Manier (2004, Biol. J. Linn. Soc., 83:65-85) using morphological analysis, concluded that no subspecies of Rhinocheilus lecontei should be recognized. R. l. tesselatus and R. l. lecontei become R. lecontei. Rhinocheilus - Greek - rhinos nose or snout and cheilo - lip - "Rostral prominent forwards, rounded beneath, tapering upwards"
lecontei - honors Le Conte, John L.
Wright, Albert Hazen & Anna Allen Wright. 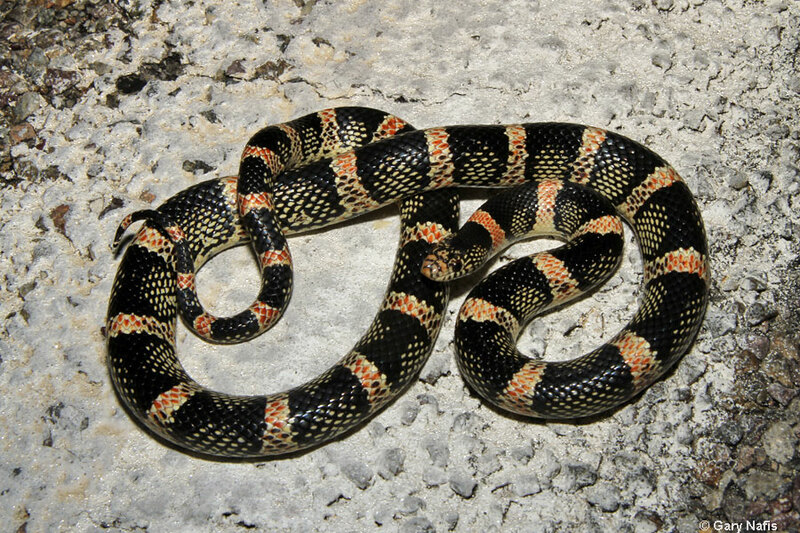 Handbook of Snakes of the United States and Canada. Cornell University Press. 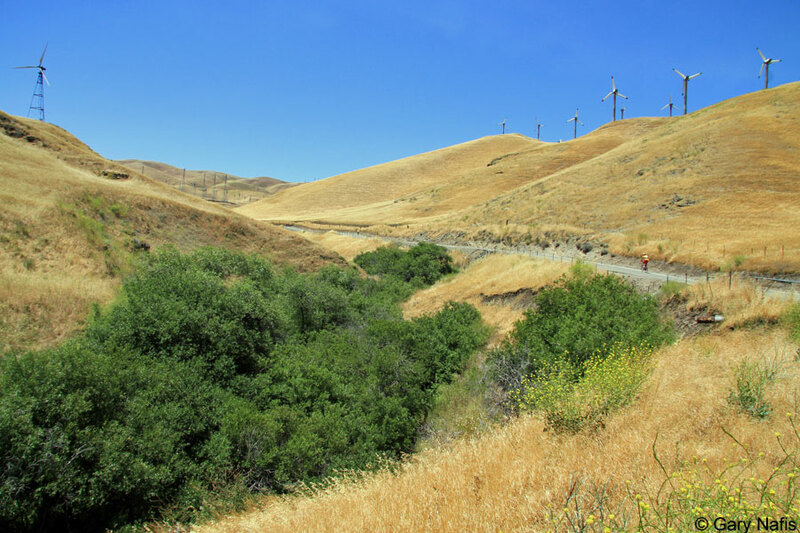 The following status listings come from the Special Animals List and the Endangered and Threatened Animals List which are published by the California Department of Fish and Wildlife.